While Skylar was struggling to escape from the duct tape, his buddies watched and even pushed him around jokingly. It was all just a bit of fun until Skylar accidentally fell, hitting his head against a window, and then slamming it into the concrete when he landed on the ground. Skylar’s injuries were so devastating, he is lucky to be alive. In addition to a broken eye socket, Skylar developed an aneurysm on his brain, broke his cheek bones, and ended up with nearly 50 stitches to patch together his broken head. Although the long-term prognosis is still not certain, so far Skylar has not recovered the sight in his damaged eye. “I don’t know what I would do if I lost him,” the teenager’s motherm, Sarah Fish, Q13Fox.com. 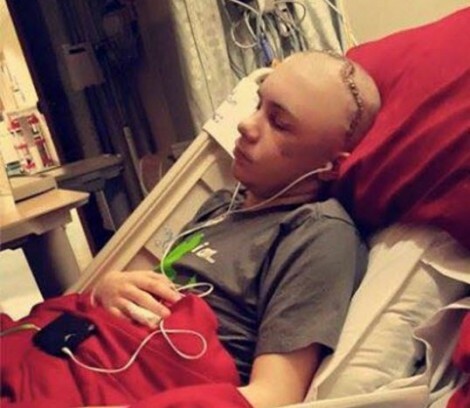 “The told me over and over that … he’s lucky to be alive.” After this horrifying experience, Skylar and his family now want to educate others on the risks of taking viral video challenges such as the one that severely injured the teen. Family and friends of Skylar Fish have put together a GoFundMe campaign to help offset the costs of his medical care and recovery.